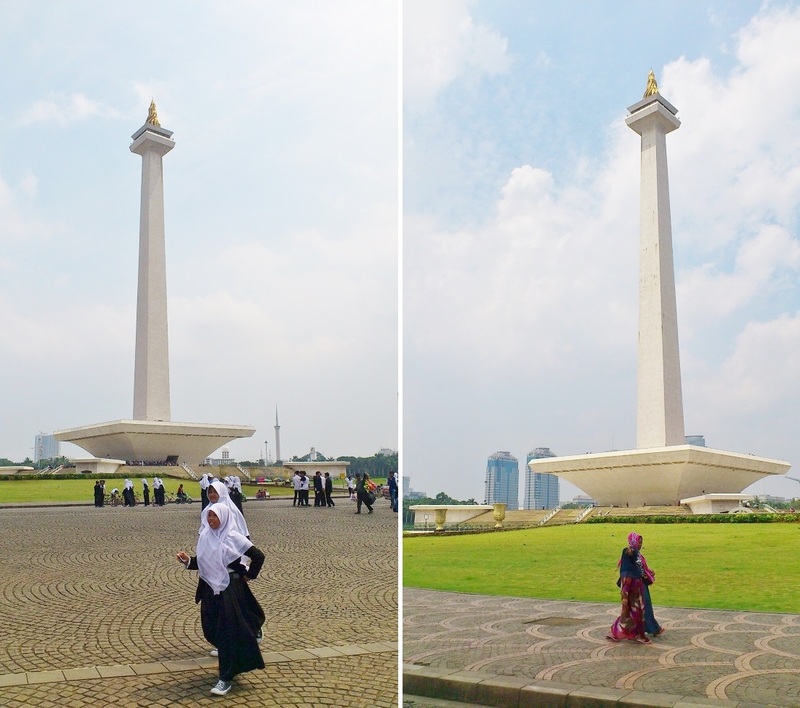 Jakarta’s Focal Points: A Historical Perspective | What an Amazing World! 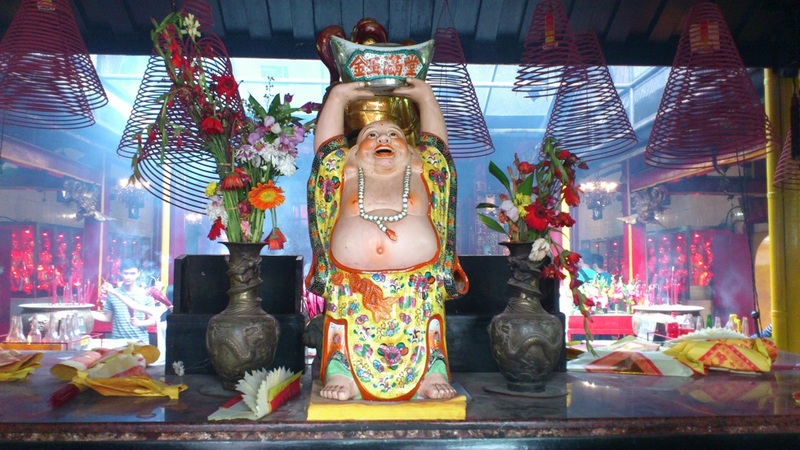 Dong Mei could not hide her excitement upon learning how well Cafe Batavia met her expectation: the imagination of an exotic restaurant in the South Ocean, or Nanyang – a term loosely used to describe regions south to the Chinese mainland what today comprises of Southeast Asian nations. She just arrived in Jakarta from a red-eye flight from Beijing a few hours earlier, and this was evidently a much sought-after welcome for her first visit to Jakarta. Sitting at Fatahillah Square, Cafe Batavia occupied a two-storey old building dating back to the time when this part of Jakarta was the seat of Dutch colonial administration in the Netherlands Indies. Surrounding the square was a collection of some of the city’s best-kept 18th-century architecture jewels, some had been fully restored to their former opulence while the rest crumbling down and largely untouched. Outside the restaurant was a huge gathering of families and friends sharing happiness on the sunny Saturday afternoon. 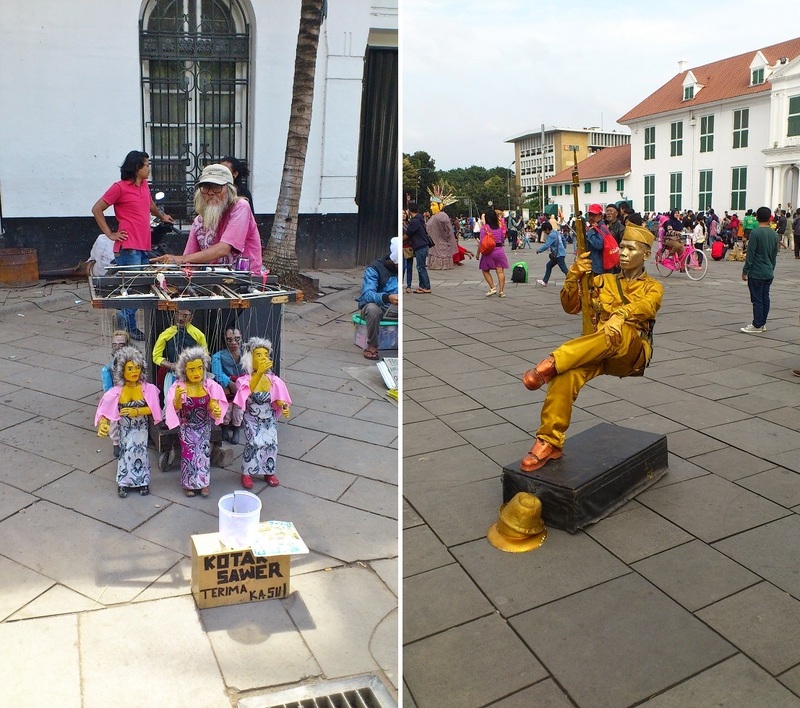 Jakarta’s humid air did not deter some of them from cycling around Fatahillah Square on colorful vintage bikes, taking photos with a plethora of funny characters, and watching in amazement as street artists put their best performance for the inquisitive audience. 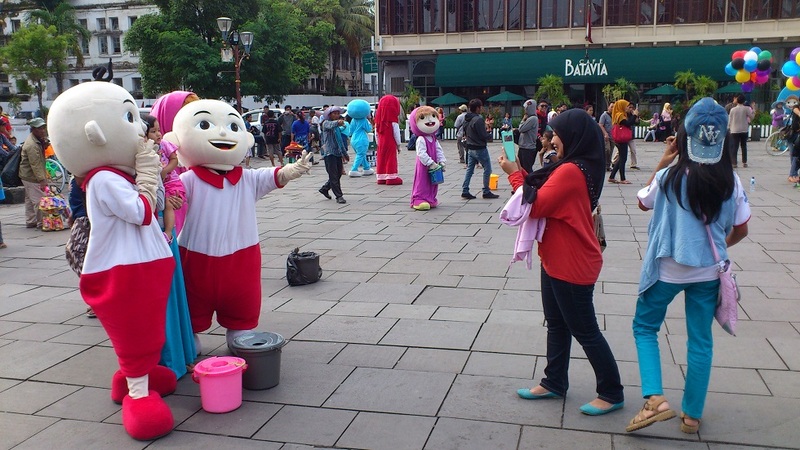 It was probably one of the happiest places in Jakarta that afternoon. One particular performer caught the most attention. Clad in golden colonial-era military uniform with copper boots, the man sat still, holding a rifle on one hand. It was not his appearance that piqued people’s curiosity, but on which the flat-faced artist sat: thin air, or what seemingly to be. Men and women, young and old, all gave a good long look at him, some did a closer inspection hoping to learn about the trick, everyone was gleefully baffled. That afternoon was a testament to the importance of having such a large public space in a city. Unfortunately in a rapidly developing urban sprawl like Jakarta malls and shopping centers are increasingly filling more space, consequently public squares becomes scarcer. 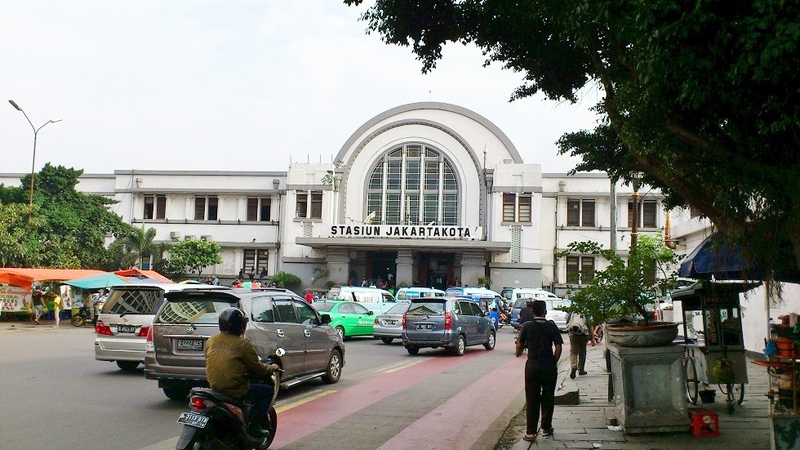 The tree of us – Dong Mei, Agus, and I – then left the joy-filled square and walked towards Glodok in Jakarta’s Chinatown, past one of the oldest train stations in Jakarta: the Jakartakota station, or simply known as Kota station. 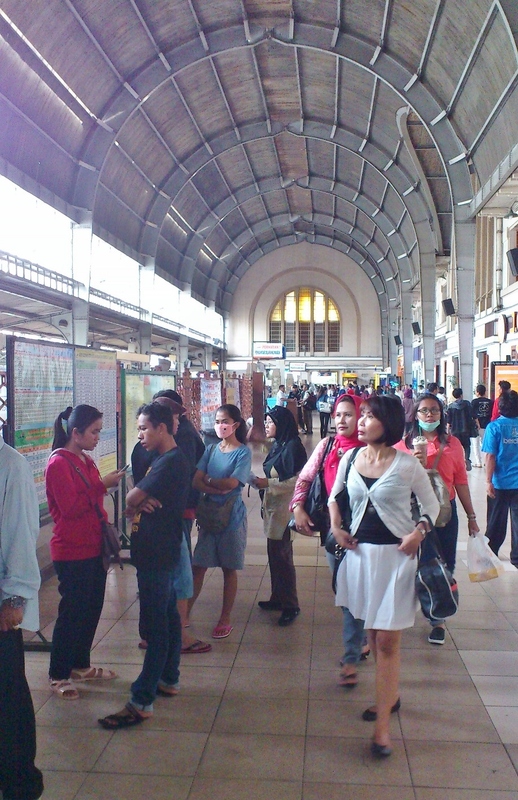 Its Art Deco exterior was a hint to the timeless colonial charm beneath the station’s arched ceiling. 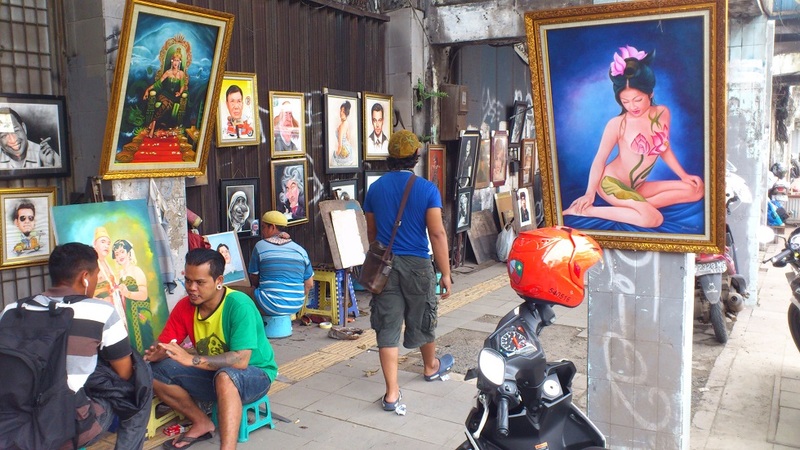 After crisscrossing our ways through chaotic intersections, not unusual in Jakarta, we sauntered down the sidewalk where talented street painters displayed their best works in front of empty shophouses, some were left by their owners following the 1998 riots in Jakarta. Realistic images of prominent figures from the Princess of Wales to Leonardo DiCaprio, Marilyn Monroe, Justin Bieber and local celebrities as well as Nyi Roro Kidul – the queen of the south sea, arguably the most revered mythical figure in Java – lured passers by alike. Short moments later we heard harmonious melodies from different musical instruments emanating from one end of the sidewalk. It grew louder as a music troupe walked closer to where we were. With both modern and traditional instruments in hand, they were busking through the relatively empty pavement, walking past us in a constant, rhythmic pace. “I can feel desperation in the air, but at the same time, people seem to not focus on that. They paint, they play music,” Dong Mei described her perceived sentiment towards this corner of the city. Agus, the most well-seasoned traveler among us who had explored Mongolia, Afghanistan, and everything in between, took us through narrow, and as Dong Mei put it, depressing alleys of Petak Sembilan at the heart of Jakarta’s Chinatown. Past a wet, dirty traditional market, where uncompromising stench assaulted our noses, we arrived in a rather humble Chinese temple for which this hidden maze of alleyways was famous for. Kim Tek Ie, literally ‘Golden Wisdom Temple’, was first built in 1650 as Koan Im Pavillion. Almost a century later in 1740 the temple witnessed one of the darkest events in Chinese Indonesian history: Chinezenmoord, Dutch for ‘Murder of the Chinese’. Following unrest in Batavia due to the collapse of sugar price, a group of Chinese people attacked and killed 50 Dutchmen. Fueled by retaliatory spirit the Dutch systematically killed more than 10,000 Chinese people in a two-week long pogrom. Fifteen years after the massacre the temple was rebuilt and renamed Kim Tek Ie, a reminder of what humans should put forward: wisdom in everything. 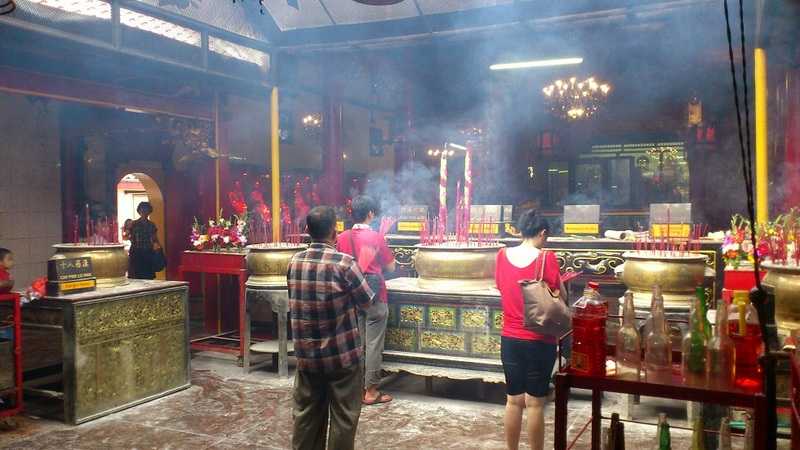 Over the time the temple underwent a number of renovation works, and on our visit the temple was filled with people praying to multiple deities venerated in the temple. Dong Mei had her reservations, however. Inside the temple, rows of giant candles flamed ferociously under a semi-permanent tent, with big Chinese letters on its backdrop. The flames were so big that what I feared happened one week after our visit: most of the historic temple was destroyed by fire. However Kim Tek Ie’s status as one of the city’s most important heritage sites, as well as its significance for the local Chinese community as a means to reconnect with their cultural roots, ensure future restoration works. 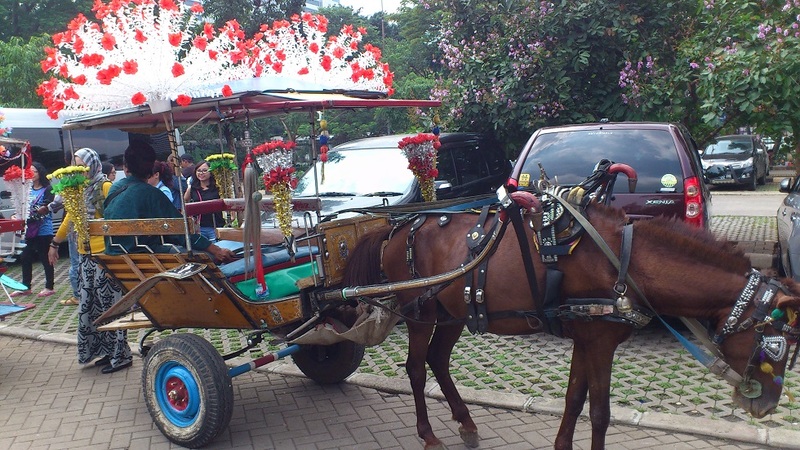 Jakarta’s old town district, formerly known as Old Batavia, was its focal point from the 17th to 19th century. 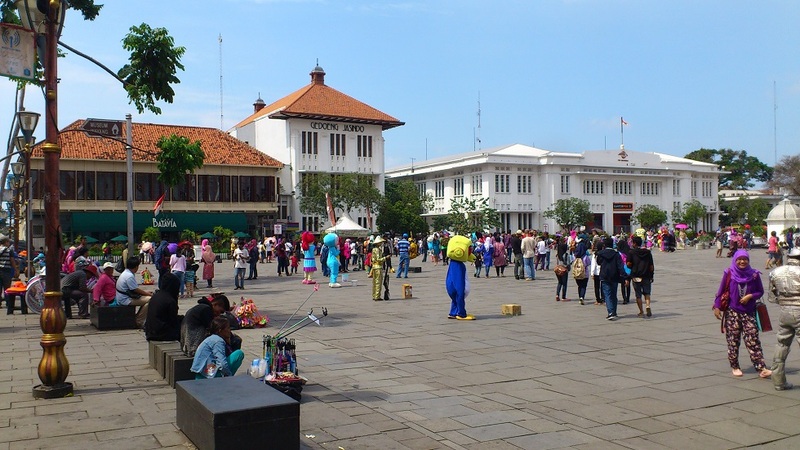 But due to bad sanitation and the increasingly overcrowded neighborhoods of the district in the early 19th century Herman Willem Daendels, at the time governor of the Dutch East Indies, moved the center of administration of Batavia southward around Koningsplein – the Royal Square. Today the square is the center of administration of Indonesia with the presidential palace, constitutional court, supreme court, and several ministries lining up the streets around the 1 sq km rectangular square. At its heart is Monumen Nasional, better known as Monas, a 132 m monument, inspired by lingam-yoni in Hindu tradition, erected to commemorate Indonesia’s struggle for independence. Dong Mei enthusiastically followed one cute little girl to take photos of her, but the girl was too shy and her mother did nothing but enjoyed the scene. Then we drew ourselves closer to the whitewashed monolith, clad with Italian marble and topped with a 14.5 ton gold-coated bronze flame. On the ground, radiating from the monument were a throng of schoolchildren, seemingly curious about us. A few of them braved themselves to ask us to take a few photos with them – never happened to me before as a local. “In China people don’t smile to strangers,” Dong Mei said. “The smile was one thing I missed when I lived in Beijing,” Agus added. We did not stay too long, nor did we try to go inside the monument for the long snaking line at the entrance seemed to move at a snail’s pace, if it moved at all. Northeast of Monas was where we headed next, towards what was often dubbed as the largest mosque in Southeast Asia: the Istiqlal. Unlike most mosques that I had been to, Istiqlal’s architecture and interior were rather dull in ornamental elements, more imposing than mesmerizing. To the nod of that Agus said, “it looks like a Soviet building with a massive dome added on top,” comparing it to the communist structures scattered in Central Asian countries. 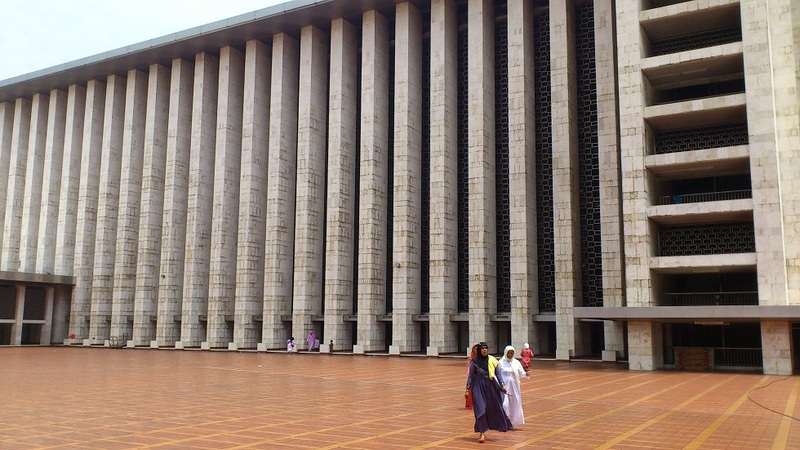 Designed by a Christian architect, Frederich Silaban, the Istiqlal Mosque was built in a time when the newly independent Indonesia was leaning to Moscow, lending to the many Soviet-inspired buildings in the capital built in the 1950s and 1960s. From dark history to promising future, desperation to joy, Soviet architecture to Art Deco, Jakarta’s old and new focal points unveil the city’s long and twisted history in becoming the capital of the world’s fourth most populous country. They tell me stories, and show me how appealing the city can be beyond its perennial traffic congestion and choking pollution. All photographs were taken with my phone’s camera. Hence the unusual dimension. Thank you. History tells us what humans could do, from horrible to noble deeds. That’s why it’s important to learn history, to make us better humans. It certainly has its own charm. The good thing is more and more old buildings are being restored to their original condition. Such a bustling and vibrant spot. Your posts are always so well researched Bama and eloquent. Gorgeous photos too! Thank you, Sue. I remember my sheer horror to watch on TV how Jakarta became a war zone back in May 1998. So to learn the effect of those horrific events to the local community firsthand was such an eye-opening experience. 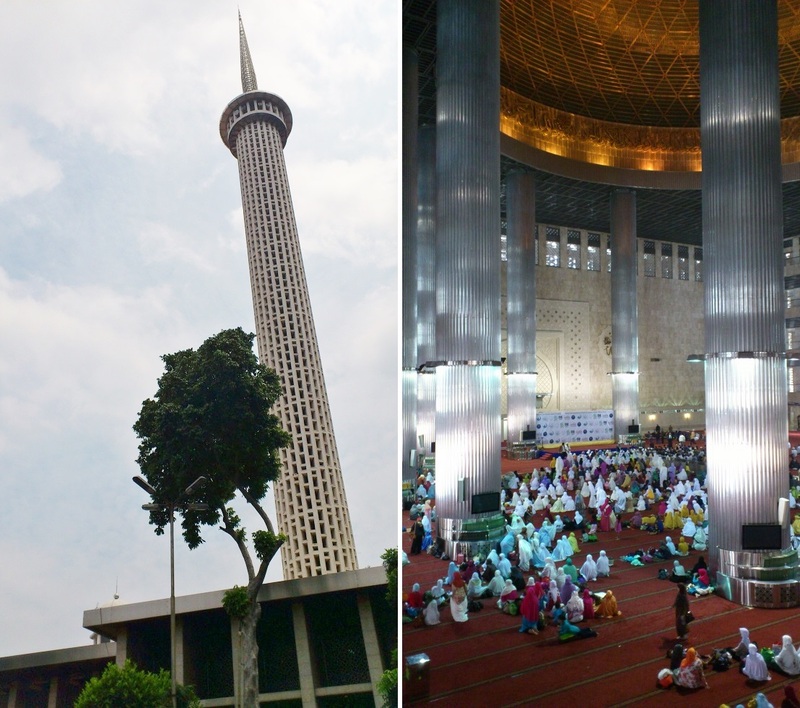 We have same perspective for Masjid Istiqlal, I thought as the largest moslem country in the world we must have more ornamental national mosque. But, based on your assumption that it was influenced by Soviet communist building, I can understand now why it is gigantic and cold. It’s been a long time question for me: why does communist regime -or a country which is influenced by- love to build a gigantic and cold building? 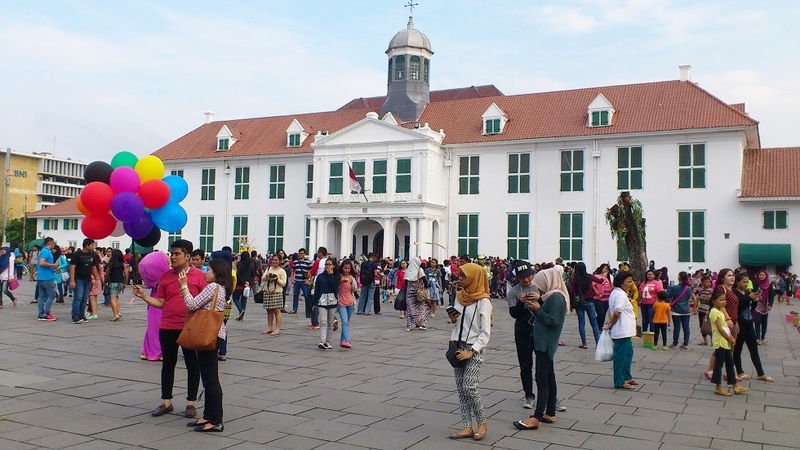 Wacana untuk menjadikan area Kota Tua sebagai heritage site yang dinamis sudah digulirkan sejak beberapa tahun terakhir, tapi sepertinya masih ada kendala di sana sini. Tapi dari hasil obervasiku sih sepertinya sudah mulai dilakukan pembenahan serius terhadap gedung-gedung terlantar. 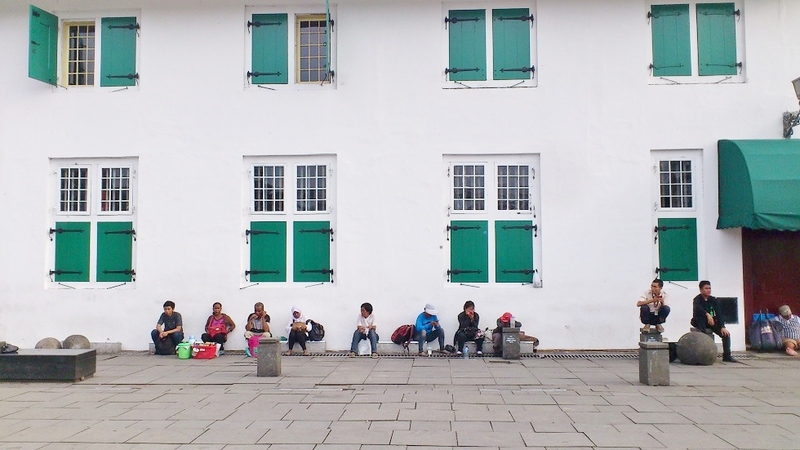 Kota Tua is one of the best things Jakarta has to offer. Thank you, Nurul. Within those five years since you were away, did you come to Jakarta occasionally? I believe five years from now the city will be quite different from how it is today, in a better way hopefully. It’s all my pleasure, Nugie. We all surely hope that the city will see a better future, chiefly regarding to its traffic and pollution problems. But if one looks deep enough, Jakarta has its own charms. hi Bama i always enjoyed reading your blog… you always uncovered the best of the places you visited, and i hope that you would scratch the city’s hidden gems more.. Thank you for reading, Nadia. Well, sometimes I get lost in a city. But a little research prior to visiting a new city will always certainly help. 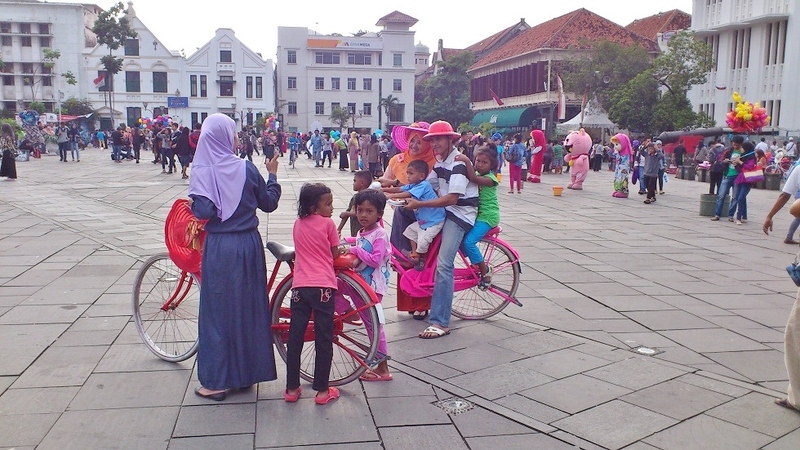 Bama, the photos bring me warm memories of the 2 days I spent in Jakarta 🙂 I remember those guys clad in gold…the bikes…the vendors – so much vibrant human energy. Feels much like a #throwback post for me. Hi James. It’s been a while since the last time I saw you on the blogosphere. Glad to see you back! 🙂 When you went to Kota Tua, did you feel a similar ambiance with Manila? Because when I was in Manila everything did remind me of Jakarta. I love reading your insight about Jakarta. The whole island of Java holds so much history. I haven’t been to Jakarta and it seems like it always gets overlooked among the many destinations of southeast Asia. The train station is fantastic! What an architectural gem. Thanks for another great post! Jakarta is a city many find hard to love, to begin with. Constantly congested traffic and persistent air pollution are two main reasons why it is often overlooked by travelers who go to Southeast Asia. Even for me, it takes years until I begin to see the charm of the city, affectionately and aptly nicknamed the big durian. Thanks for reading, Kelly. It’s always a pleasure following your journeys to fascinating places like Oman and Nepal. Wow, I can imagine how empty Kota Tua must have been back then, years before it started to pique people’s interest. Promoting such an old quarter as a tourist destination would usually help its preservation, but often local authorities are not ready to deal with the environmental pressure that tourism brings. Sad, and it has to be addressed very soon because now we’re starting to get really overwhelmed by the amount of trash we see in tourist hotspots. Kota Tua, best spot in Jakarta indeed! So much to learn in what seems to be a simple outing to the heart of the old city. Not to mention museums around the Fatahillah Square 🙂 My favorite so far would be Museum Bank Indonesia. Mas Bama, salam kenal ya, saya Yanti. Kayaknya baru pertama ini komentar di sini (lupa, hahaha). Mungkin akan bersuara lagi di post yang lainnya. Terima kasih sudah berbagi kisah petualangannya! Museum Bank Indonesia is by far still one of the best and most well-preserved museums in Indonesia. 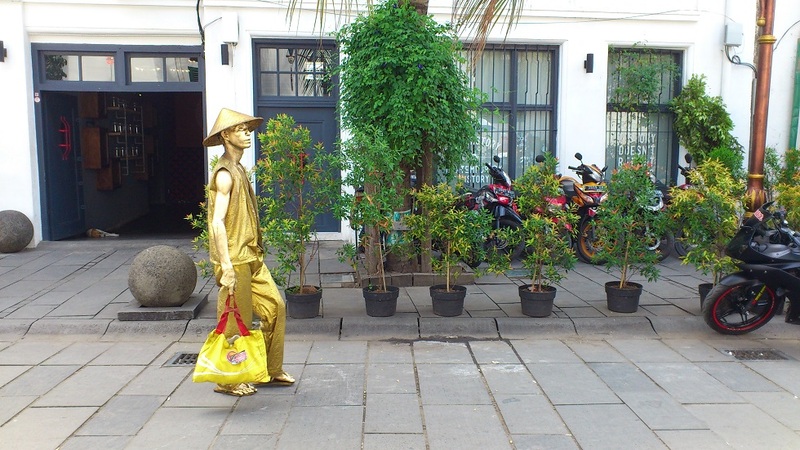 As for Jakarta’s colonial district, I really want to explore Menteng and Cikini. Somehow they’ve been overlooked by other places in the city. Ini bak buah simalakama sih. Kalau Kota Tua sepi, gak ada yang mau mengucurkan dana untuk revitalisasi gedung-gedung tua. Tapi ketika mulai rame, Kota Tua pun mulai semrawut. Penting banget penataan yang benar supaya gak tambah semrawut yang nanti ujung-ujungnya bikin Kota Tua berkurang peminatnya. Hi Bama, Fatahillah Square looks like a very pleasant place to be – so clean, so vibrant with all the colors and sounds, the lovely surrounding buildings, interesting sculptures, etc. I was sad to read the massacre history behind the Golden Wisdom Temple. Ahh, the cruelty of colonialism. Interesting to see a Soviet-inspired design on a mosque. I agree with you, it looks more imposing than mesmerizing. Your images look great for camera shot photos. Recent revitalization works around Fatahillah Square have helped keep the square clean and the Dutch buildings beautiful. But what I really loved was how it became a place where local artists displayed their creativity and visitors appreciated them. 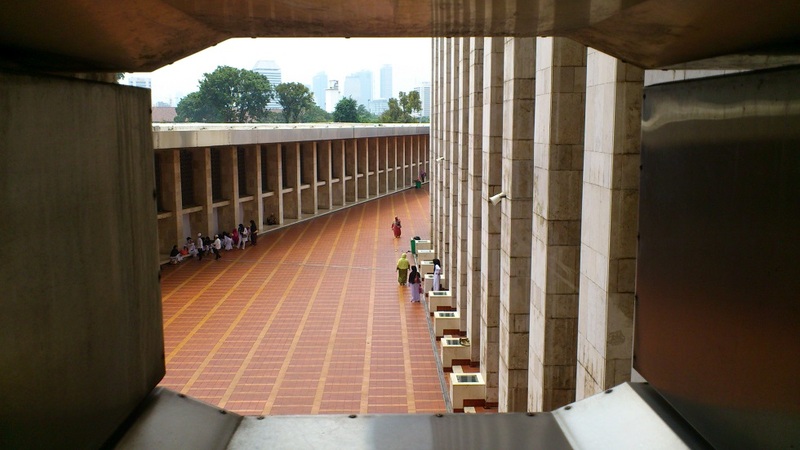 As for Istiqlal, it still is the biggest mosque in Southeast Asia, but it certainly is not the prettiest. I’m glad i came across to this post in my blog reader feed. having aware and saw the glimpse image of street painters can really give one a crystal clear message that such talent are worth any recognition. To my attention, exhibiting such artistic efforts in such circumstances are rather sad. A proper places are necessary that is, but to think that such strategic place can allure visitor/tourist and street-passer resulting a higher chance of buyers cannot just be ignored. I just wish the painters can hold enough money to get one of those building, renovate it and put into a good use as they see fit for the sake of their business. An art gallery in the heart of the old town? not necessarily a bad idea. 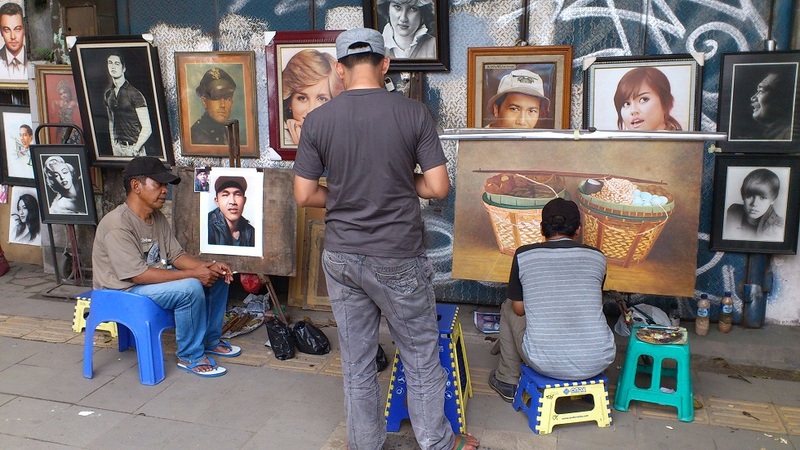 Having an art gallery just around the corner, or at unassuming premises, or at Kota Tua, or anywhere else where people least expect to find one would be really interesting. Museums and art galleries not only do showcase human’s creativity, but also tickle that little artist in each and every one of us. I think many years ago they had such place at Pasar Seni, Ancol. But today I don’t think it serves the purpose it was once conceived from. Thanks for your thoughtful comment, Madito, and good luck with your thesis! Have a good day too! Love the post and the detailed story. I am myself travelling around the world. Right now in London will visit Jakarta in February next year. Hi Jody. It’s great to know that you’ll visit Indonesia as well on your trip around the world! However do expect rainy days as it is still wet season in February.